Is considered a threat to public safety? There is no maximum time limit for detention of immigrants in Canada, hence, indefinite and it’s a serious matter. On some occasions, there has been an exceptionally lengthy detention. For instance, a rejected Iranian asylum seeker was released after being detained for six years in a maximum-security provincial prison in December 2011. This is due to the fact that he refuses to sign his deportation documents. Yet, the average immigration detention length in Canada is between 1 -6 months. 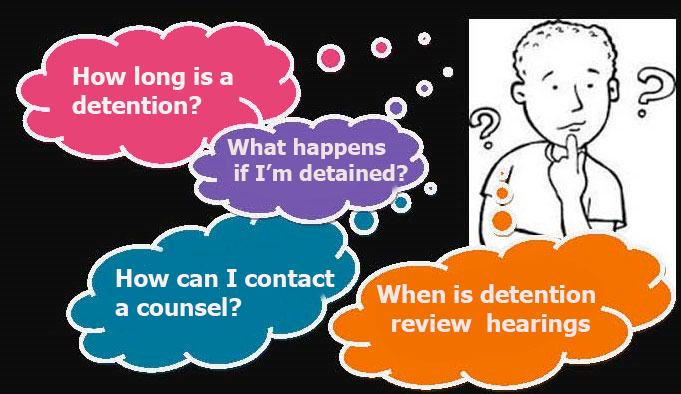 What happens after a detention? In as much as a permanent resident or foreign national are detained based on immigration-related offences, the CBSA must send notification to the IRB. The first detention may last up to 48 hours after which a detention review hearing must be observed by the IRB’s Division of Immigration. If the verdict of the IRB member is to extend detention at the hearing, the case must be again reviewed within the period of seven (7) days, and every 30 days continuously. Yet, all detainees reserve the right to request an early review whenever new information on their case is received. If a permanent resident or foreign national violates the conditions of IRPA, such a person can be issued a removal order by CBSA or IRB’s Division of immigration. Refugee claimants whose refugee claims are rejected are issued an order of departure, and must give a notice to the CBSA and then vacate Canada within 30 days. If this order is not met, they will be issued a deportation order; which is usually reserved for those inadmissible for reasons of criminality, and are permanently barred from returning to Canada unless they receive written permission from the government. For violations that are less serious, an exclusion order is given, where such a person is removed and does not have the capacity of returning for a year unless there is a written permission from the government. Although it is possible for you to represent yourself in your hearing, you may still require the assistance of a counsel. Counsel can either be a lawyer or a registered immigration consultant. If you reside in Quebec, a notary can as well be a counsel. It’s your responsibility to pay your counsel. If you decide to get the help of a counsel, you are advised to do so as fast as possible. CIIS possesses licensed immigration consultant in Canada who can be of help even without a professional fee if your case warrants (conditions apply). What happens in detention review hearing? The hearing is being overseen by an ID member. The member will commence by introducing everybody and explaining the events of the day. There will as well be an interpreter at the hearing to translate for you in case you do not understand French or English. The CBSA representative will explain the reason for your detention and present the facts to back up their decision. A number of reasons can be provided. Then, you and/or your counsel will be granted an opportunity to respond, explain your opinion and to ask questions. If there are witnesses at the hearing to provide information, the CBSA representative, you, your counsel or the member may ask them questions. After hearing from both the CBSA representative and you or your counsel, the member will decide whether you will be released or stay in detention. What Happens after your release? If you are lucky to be granted a release order and decide to remain in Canada, you must strictly adhere to the condition of your release. These conditions will continue to be valid until you are evacuated from Canada or until they have been modified or cancelled. You or your counsel (If you have one) can ask the Immigration Division to change or cancel your conditions if a long period of time has passed since the conditions were imposed and you have been obeying them, or if your situation has changed a lot since they were imposed on you. You must write a letter to the Immigration Division explaining why you think your conditions should be changed and send a copy of the letter to the CBSA.